A true breakfast treat, these are surprisingly filling and hearty and almost similar to eating oatmeal. That's probably because there are whole oats in the batter, which make the muffins thick, dense, and chewy. Add a substantial amount of diced apples and yogurt, and you've got a moist and cake-like center that's a great contrast to the slightly cripsy top and edges. Although the diced apples are "drained" on a paper towel to remove extra moisture, this doesn't take away from the finished product. A hint of cinnamon (because it goes great with apples, of course) adds a light spice and fragrance. Fresh from the oven, these muffins are amazing. And of course, they're easy and quick to make! Make again? 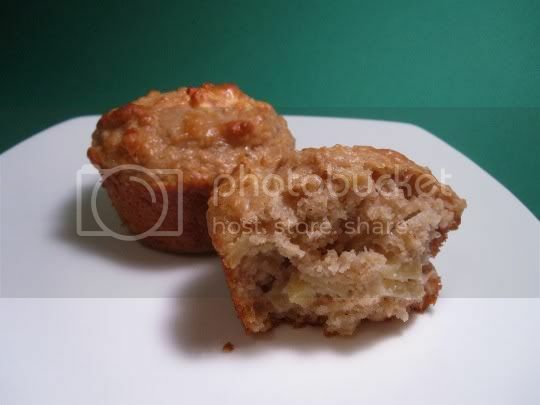 Muffins that incorporate the flavors of apple-cinnamon oatmeal...yes please! This looks so good! I am going to make this. Does not seem that complicated!